A co-signer for a business loan is someone who guarantees the loan will be paid if the borrower defaults on the loan. A small business owner looking for a start-up loan should search for possible co-signers and be prepared to present co-signers if asked by the lender. A co-signer is also known as a guarantor for a loan. It might be said that the Small Business Administration loan guarantees serve the purpose of "co-signer" on small business loans. A lender usually requires a co-signer when it needs more information or more security to be assured that the loan will be paid off. Banks may require a co-signer on business start-up loans because the new business owner has no business credit history for the bank to rely on to pay back the loan. If a lender says you must have a co-signer for a loan, you may want to look first at family members or close friends. A co-signer should be someone you trust, but also someone who has some assets they are willing to pledge and someone who has a very good to excellent credit rating. The co-signer doesn't just sign on the loan; he or she is making a promise to repay the loan if the borrower defaults. 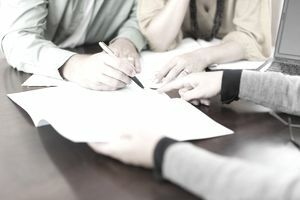 The co-signer usually is required to provide collateral, in the form of property or other assets, which the bank can sell to recover its money in the event of a default. The co-signer is required to provide a personal financial statement, and the co-signer's credit rating is checked and considered in the loan acceptance. The co-signer is required to pay late charges, fines, and penalties if the original borrower fails to do so. The applicant may be told by a bank or other lender that a co-signer is needed. The co-signer usually must have either an excellent credit rating or, in the case of a business loan, personal or business assets that can be pledged in the event of default. The co-signer must go through the application process along with the applicant, must produce documents that verify credit rating or value of assets. Finally, the co-signer signs all loan documents, asserting that he or she will honor the terms of the loan. The co-signer receives communications from the bank and is notified in the event that the applicant does not make payments in a timely manner. It is a difficult question. From the standpoint of the business owner who needs a co-signer, it may be the only way to get the money. From the standpoint of the co-signer, it may or may not be a smart decision to co-sign. If you and someone else enter into a co-signer relationship, make sure to get everything in writing.